Fit-It - Frames by Red Castle, Inc. NOTE: Stop back often to see the updates to the gallery. Always click on you browser re-load button to see the latest. 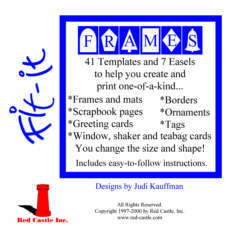 Click here to see a complete list of the templates included in Fit-It Frames CDROM, and the gallery of samples. Fit-It Frames Demo Version is available for downloading, to let you see how the program works. The file is approx. 658KB. The template in the Demo Version is a "Snowman" that can be sized and shaped as the 41 templates in Fit-It Frames can be. 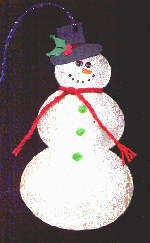 The Snowman is not a template on the Fit-It Frames cdrom. THE TEMPLATES DOWNLOADED MAY NOT BE SOLD OR GIVEN AWAY OR REPRODUCED IN ANY WAY.